Please refer to our stock # KO-96 when inquiring. 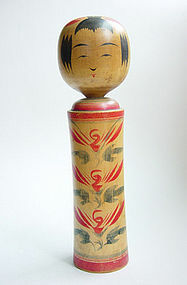 Kokeshi, Naruko-kei, Miyagi Prefecture, by Takahashi Takeo. Birthdate=Taisho 5 (1916) July 26. H. 9.75” x Dia. 2.25” (24.75 x 5.75 cm.) Dentou, or "traditional," kokeshi hail from the northeastern part of Japan known as the Tohoku region. Tohoku is comprised of Aomori, Akita, Yamagata, Iwate, Miyagi, & Fukushima Prefectures. They are colorfully painted (or bare, in the case of one Nambu-kei kokeshi from Iwate) wooden dolls of female gender that have been around since at least the Edo Period (1600-1868) and are still produced and sold today at various hot spring resorts and other traditional production centers in the region. Legends about the origins of kokeshi are difficult to prove, but they are thought to have possibly been a totemic type of stand-in for infants and children in old NE Japan. This area was at one time one of the most impoverished and environmentally harshest regions of the country. Infant mortality was high, possibly more so among females as we can assume that in this agricultural setting, males were valued more and better taken care of. After a safe delivery, or a healthy upbringing, the doll could be destroyed by burning or tossing in a river. This was a common practice with other types of dolls in Japan known as 'amagatsu' (used by the aristocracy) and houko (used by commoners.) Still today, we can find 'kokeshi ohaka' (kokeshi cemetaries) at a few temples in NE Japan, where older, unused kokeshi dolls can be brought for burning. And, ritual burning at sea of dolls and children's toys is another practice still carried out in many parts of Japan. What we do know for sure is that kokeshi were actual folk toys for the children of the Tohoku region, which was also well known for itinerant woodcrafters, and the spare time in the long, cold winter months to pursue such craft works as weaving, dying, embroidery, woodworking, and clay/paper/wood doll making. As such, they are usually included in the genre of craft items known as "mingei," or folk craft. Today, kokeshi are purchased by locals and tourists alike, mainly at the many hotspring resorts dotted around Tokoku that have kept this traditional craft alive, mostly passed down from father to son. Each locale has its own style, pattern, color combinations, etc. But, successive generations of kokeshi artisans have also been able to incorporate their own touches rather than merely copying their forefathers' work. By repeating the pattern of their ancestors through long apprenticeships and countless repetitions on a theme, the designs do eventually become their own. This reliance on what Folk Craft Movement founder, Yanagi Soetsu called the "Other Power" ('tariki' in the Buddhist sense) is what makes these dolls a link to tradition, as well as a contemporary product of aesthetic beauty. Being the collectible item today that is produced and used mostly for display purposes, kokeshi can no longer be considered a "folk toy." However, the spirit of the artisan is what's important to me here. There are other versions of kokeshi today called sosaku "creative," "modern," or "art" kokeshi. These are not bound by traditional designs and patterns, but are artistic interpretations by individual artists, creating a name for themselves. The are also omiage “souvenir” kokeshi sold everywhere in Japan as inexpensive trinkets for tourists. However, Dentou Kokeshi hail only from the Tohoku region of NE Japan and are still representative first and foremost of their regions and traditions.